Our trip was all about the Arctic wildlife. 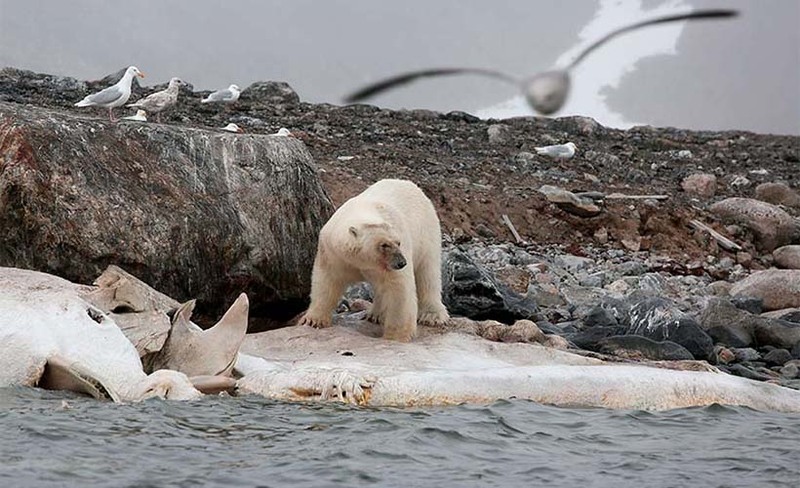 The best opportunity to photograph a bear surely had to be the site where the remains of a sperm whale had been drawing bears for at least a month. There is never more than one bear at a time, with the bear hierarchy strictly enforced. But there’s plenty to go around and they were only starting to get to the meat under the blubber. We had been lucky to have numerous bear sightings over ten days and each time, our landing process was preceded by a scouting expedition to make sure no unnoticed bears were lurking nearby. Each member of the expedition staff accompanying us on land is armed with a rifle and a flare gun. There was an inordinate number of birders and botanists on our trip, and they enjoyed the rich display immensely. 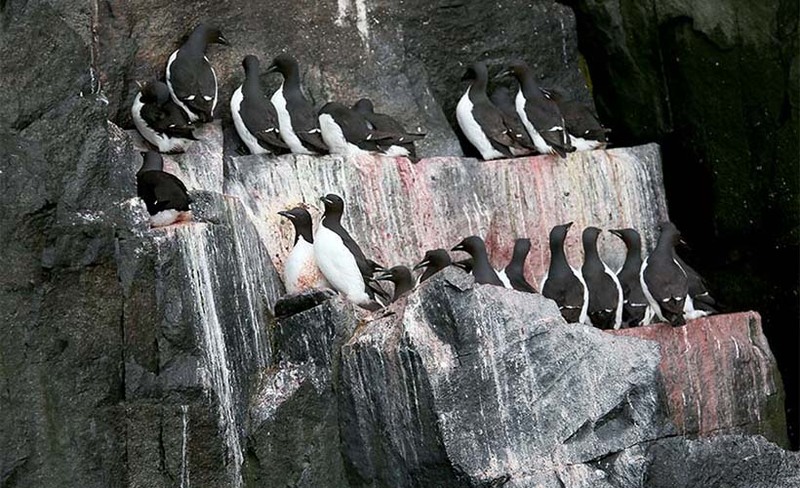 Apart from the puffins, eider ducks and glaucous gulls seen everywhere, we visited the dramatic Alkefjellet cliffs which play host to 60,000 breeding pairs of Brunnich’s guillemots. It’s a city of high rise apartments, with narrow ledge after ledge rising out of the sea on 100-metre-high towers of dolerite (for the geologically minded). We timed our zodiac visit for late at night because the sun would be shining on the cliffs between 9pm and midnight. Night time is a meaningless descriptor here in the land of the midnight sun. 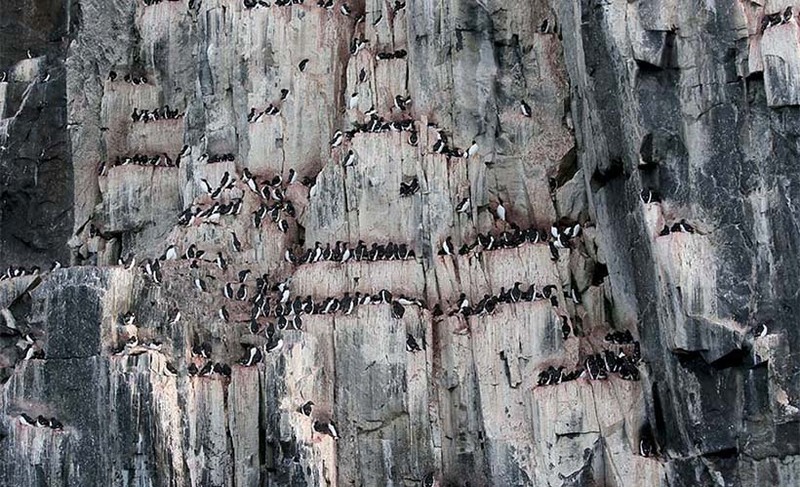 Thousands of black and white guillemots wheeled overhead and made almost impossible landings on tiny ledges that were already overcrowded. These birds do not build nests but instead, lay only one egg and, like Emperor and King penguins, the parents hold the egg on the top of their feet and swap their stewardship over at regular intervals. When the guillemot chicks reach three weeks of age and are still incapable of flight, they are launched from their ledge and flap like crazy in an attempt to reach the safety of the water. Those who crash on land are easy prey for the arctic foxes that stalk the bird cliffs. Chicks reaching the water are then accompanied by their father for several weeks as they learn to dive and fish while their wings and plumage mature enough for flight. They are akin to small flying penguins. 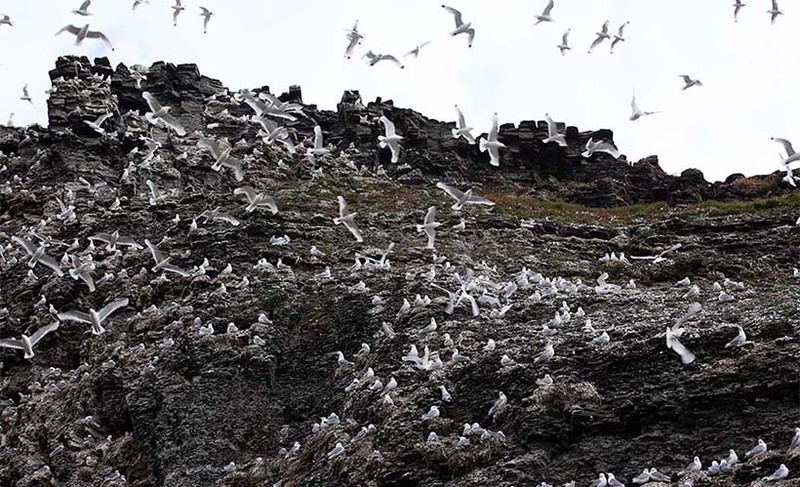 Kittiwakes also congregate in huge numbers. These small gulls with black tips on their wings are named to reflects their cries. 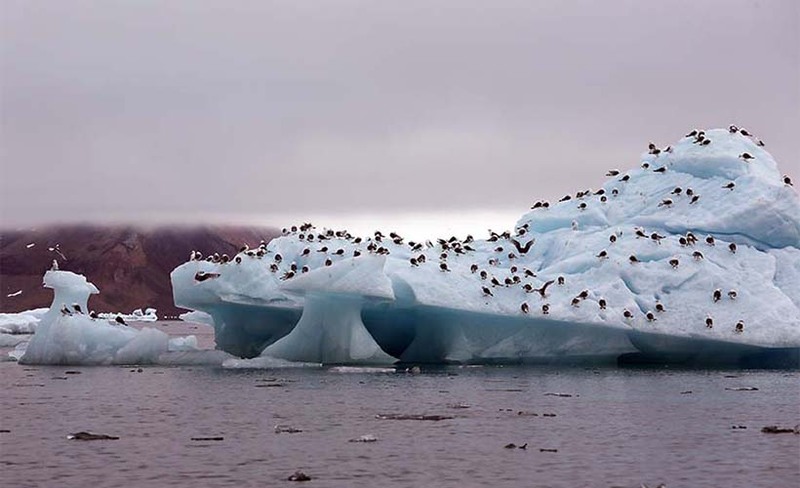 Kapp Waldburg on the south-east coast of Barentsoya island holds canyons that host many thousands of these birds. 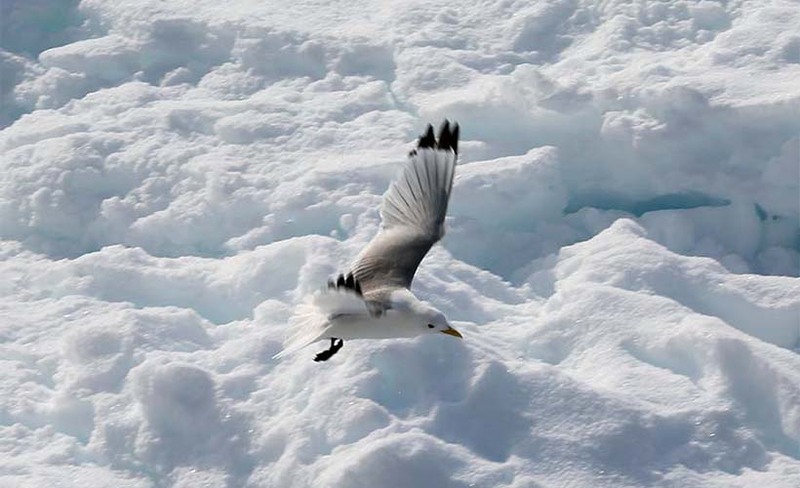 Unlike the guillemots, the kittiwakes’ preferred habitat is back from the beach in large valleys or canyons. They build their nests on rough ledges and live a communal life. Squabbles break out occasionally and, if the fight takes the combatants to ground level, the arctic foxes win again. The foxes were unfazed by our arrival as we labored up the track to the mouth of the canyon. In fact, one was sleeping on the track and only moved a few metres away before settling down to resume his nap. Their apparent sloth makes the kittiwakes forget they are there. A disturbance on one of the ledges saw a chick dislodged and it barely hit the dirt before the “drowsing” fox pounced. He calmly trotted down the slope in front of us, cached the dead chick around the corner, and came back to resume its nap. The arctic foxes at this time are in their summer coats of brown and white. They are much smaller than foxes at home but share the same characteristic brush tail. How could I forget to mention the walrus? We’ve only seen them at a couple of sites. While the hope is to find them hauled out on land or ice I have only managed to see them in the water, just off a beach. 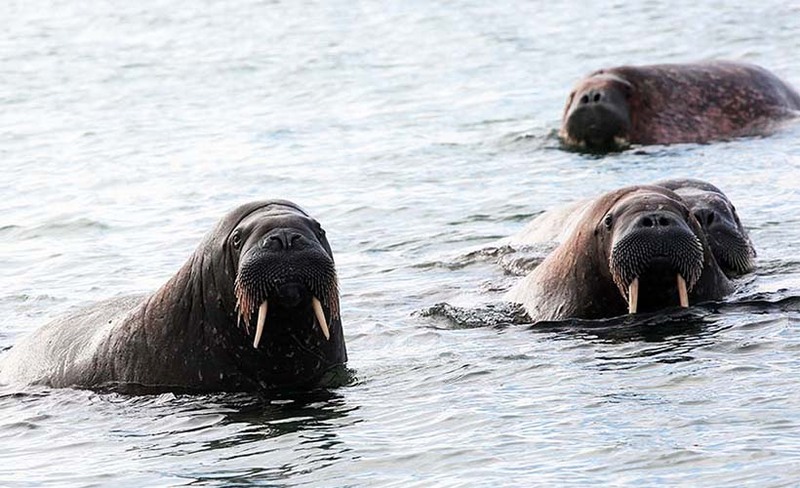 Our presence prevented them from hauling out but despite their caution, walruses are inquisitive. They came close to the beach and inspected us diligently. 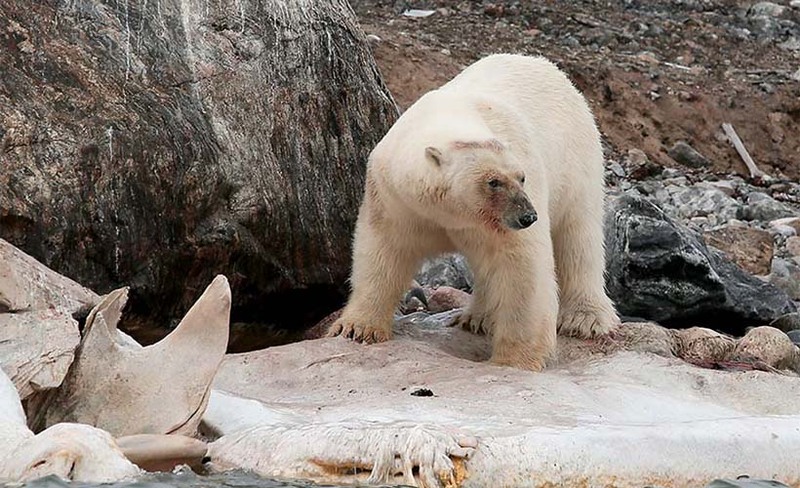 The Svalbard islands’ landscape ranges from icecap to tundra to polar desert. The tundra areas are spongy with mosses, lichens and lots of micro-flora. The plants are tiny and the botanists in our midst spent a lot of time on their knees inspecting these miniature plants. We saw more instances of polar desert than tundra. These barren, inhospitable areas of stone and gravel still play host to minute plants surviving in rocky crevices. Reindeer can be found even here, although I can’t see how they can thrive. The stags are carrying impressive racks of antler, still covered in velvet. Come rutting time, the velvet will quickly disappear as they fight for breeding rights. Our final day still held a surprise – a pod of about 25 Beluga whales, their backs gleaming white as they undulated along the coastline. We rushed to the zodiacs and ventured as close as was allowed. For a while they were penned into a bay by our presence but huffed their way past us when we drew back to open a door for their escape. If this part of the world excites you, Blue Dot Travel would love to take you there. Enquire Now.